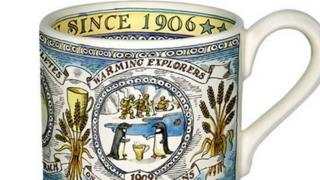 "Comforting, warming, fortifying since 1906," is written on the promotional mug Horlicks launched in the UK last year. In Britain, the malted milk drink has long been linked to bedtime, a soothing aid to sleep. In India, it's an entirely different story. "Taller, stronger, sharper," is at the top of the Indian website, which has lots of photos of energetic schoolchildren leaping about. Yet the drink's main ingredients are exactly the same: wheat, malted barley and milk. The fact that the same liquid can be perceived in two such different ways is a great example of the "crazy nonsense and beauty of marketing", says Andrew Welch. As London managing director for brand consultancy Landor, Mr Welch's job is to help brands build and improve their reputation, and ultimately create higher sales. And of course, having a presence in more than one country ensures a firm isn't reliant on the health of just one nation's economy for its success. Mr Welch says how Horlicks has been marketed is a great example of how to do it, with the drink's attributes emphasised in different ways to appeal to specific audiences. The drink has significantly boosted non-pharmaceutical sales in India for its owner, drugs giant GlaxoSmithKline. "You can't cookie cutter your brand around the world. This is an organisation which has gone beyond its home market and managed to stay relevant," says Mr Welch. Or, to use the industry lingo, "global is out" and "multi-local" is in. But it's not easy. Online auction site eBay is one of the world's best-known firms, boasting 167 million active buyers and reporting just shy of $9bn (£7bn) in revenues last year. Home rental site Airbnb is already trying to avoid that mistake, recently rebranding itself as "Aibiying" in China. The name translates as "welcome each other with love", and the company reportedly said it would be easier for Chinese people to pronounce. One of the frequent criticisms of globalisation is that it is eroding countries' distinctive differences, making cities everywhere look more and more similar. Chris Hirst, European and UK group chief executive of advertising agency Havas, says firms expanding overseas have to overcome people's natural antipathy to this. "People don't like the idea of a global phenomenon. They want to feel close to a brand and want it to be relevant to them." At the other end of the scale, firms such as fast-food chain McDonald's may appear the same in whichever country you go to, but actually works hard to localise its branches, he says. He notes the firm differentiates some menu items to fit in with the local cuisine and tends to source ingredients from the host country. "Increasingly, global means global," says Mr Hirst. In some ways advances in technology have made this easier, enabling firms to be present around the world, even in places where they don't have a physical presence. The latest annual ranking of the world's most valuable brands by consultancy Interbrand is dominated by tech firms. Apple and Google came top for the fourth year in a row. "The utility is staring customers in the face and doesn't need an explanation." In the end, what determines global success for all firms is the same thing that drives success in a company's home market, he says. "You have to have an offer that meets the needs of that audience. Your relevance has to come back to that problem: are you solving a customer problem in that market? "It's not brain surgery," he says.